I needed something to laugh to, to cry to, to disagree to, to broaden my intellectual mind to and of course were not always surrounded my people to do so. Podcasts for me provided this stimulation. So here's 5 podcasts I'm loving by content creators for content creators. Two of my fave international lifestyle content creators Lily Pebbles and The Anna Edit ventured into the world of online listeners. 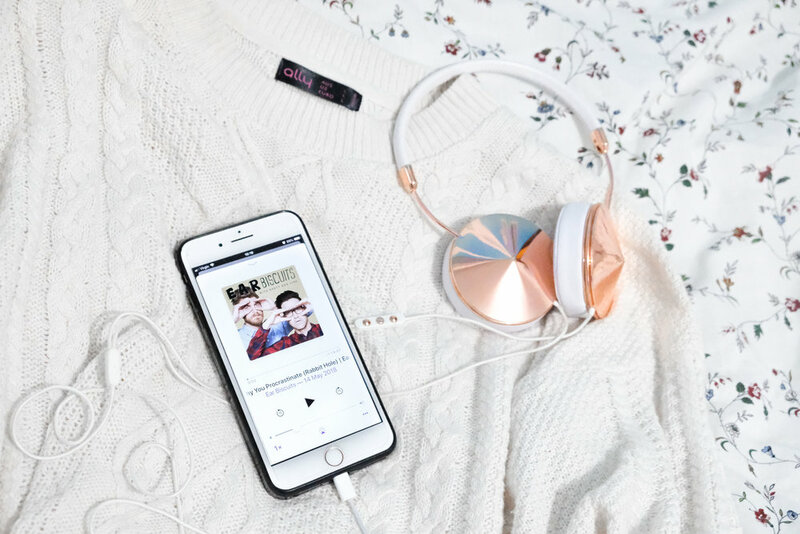 Their podcast takes us on a tour through the inner workings of creators such as Lisa Eldrige, Kate La Vie and Liz Earle. Now I don't know about you but I love delving into people's homes seeing what's different and what their most loved pieces are, along with the stories behind them. Basically I'm keen to delve through all your things and finally I've found someone who understands that need too. So if you have a similar obsession like me, this is the podcast for you. Their also about to launch with Season 2, so now is the perfect time to catch up! I think this was one of the very first podcasts I listened to that fuelled my craving for conversation. This podcast has probably evolved the most from all the ones that I have listed. It began way back in 2013 where Rhett and Link the host of YouTube show 'Good Mythical Morning' began interviewing popular content creators. Today it has evolved to incorporate a video aspect that matches their quirky best friend humor and listener involvement and personal updates. Hailing from Sydney herself this bossbabe has started the conversation by interviewing some amazing beauty babes who I also admire around Australia. She has recently brought back her podcast where we get to know more about her so make sure you give it a listen. We get to know more about the blogger, their love for beauty, juggling blogging and life and so much more. I mean who doesn't want to know all about the world of beauty and what goes on. Who knew that a comedy podcast focused on death and listener questions could cause much discourse. Who better to create podcast than OG YouTube creators the vlogbrothers. I always find the prospect of working wit family one that is quite difficult to manage. But these two have been doing it together and you can tell by the way they get excited by also disagree with each other about topics that makes their podcast that much more fun to listen to. It's another female creator podcast with two outspoken empowered women Ingrid Nilsen and Catrific. You can find them talking about talking such as 'When What You Think Will Make You Happy Doesn't', 'Forgiving Your Parents' and 'Seeking Social Acceptance' their open-mindedness and transparency is so refreshing and enlightening to listen to. If you're looking for a new perspective definitely give it a listen.